The last month of the summer has been pretty hot and humid, farmhouse ales are an excellent selection for these types of late summer days. 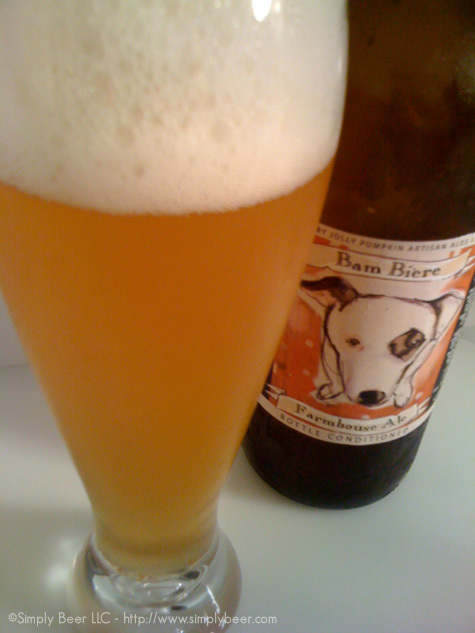 The Jolly Pumpkin beers I’ve had previously have pushed the limits of the style with their takes on styles of beer and I’m expecting no less from the Bam Bière Farmhouse Ale. Big, thick, dense head. Great lacing. I’m already liking this beer. It pours a hazy golden straw color with lots of carbonation bubbles. After a couple of minutes in the glass, the foam looked like an inverted donut, with a small mountain of foam in the middle and the think lacing on the glass. It was pretty cool. There was also a fair amount of sediment floating around the glass, but that doesn’t bother me. It looks like at one point my bottle was resting on its side for quite some time, the was a fair amount of yeast caked up to the bottle cap, could also indicate a bit of oxidation. Right away the first thing I smell is an acidic yeasty aroma, typical of tart and sour beers. But with that, there was a light floral aroma that nicely accompanied the tart aroma. It’s an extremely dry beer, has a tart taste all the way through the beer. Up front the is a slight fruity taste that quickly disappears into this low drum roll of tartness and then crescendos into this an amazing peppery, spicy flavor. Give a minute or two between sips, this beer has tons of flavor that continues to evolve in your mouth between sips. Not was I was expecting from a Saison, with that aside, this was a very refreshing beer. The aroma and the flavor marry together nicely. I’m not sure this is a beer for everyone, but I really liked the tartness and the underlying fruitiness of the beer. The hops gave this beer a good traditional pepper spice. Simply Beer Rating: 87 – Go out and try this beer! What do you think of this beer, leave us a comment. I love the JP…all their beers, and this is no exception. I love Belgian style beers that have a dry quality, like this one. I hear they are going to be putting out some non-sour beers in the near future. I would rate this a bit higher, but that’s the beauty of beer (subjectivity) that allows more than a few small breweries to exist. I am going up to Dexter, MI in a few months when they release their Perseguidor.